A bright January day and the buzz is back. Bees are active in all the hives, even Pond Hive which is always the last to get up in the morning. The occasional nice bright day like this is good for letting the bees get out to stretch their wings on cleansing flights. They may even be planning for spring already. Although the spring nectar and pollen are many weeks off yet, perhaps the queens are starting to lay now in order to build up worker numbers in time for the harvest. The beekeeper had better start preparing for spring too. 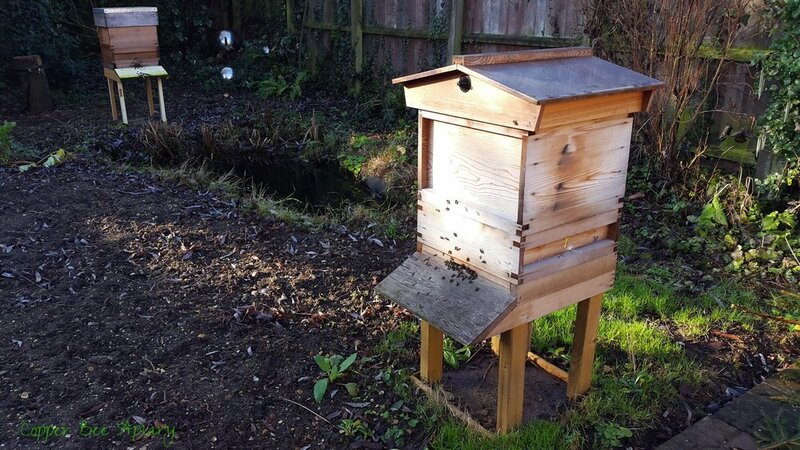 I want to rub the outsides of the hives with linseed oil for weatherproofing, replace Pond Hive's landing board and swap Cedar Hive on to a stand with taller legs. All of which I'd prefer to do on a cold, gloomy day when the bees are huddled inside, rather than when they are zooming curiously about. I'm sure that chance will come...we have many more weeks of winter to go. But today is a reminder that spring is on the way.